This is the time of the year when tomatoes are in abundance if you have a garden or visit your local farmer’s market. Don’t waste the left over tomatoes from your garden. 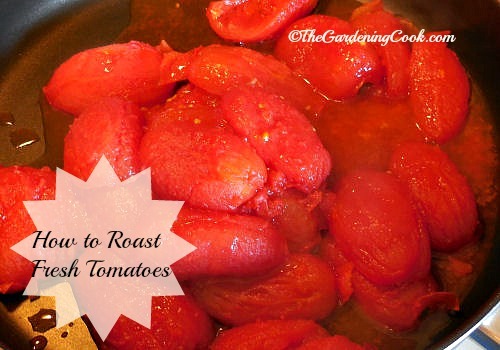 Roasting Fresh tomatoes gives a great taste to any marinara sauce recipe. I love sweet tomatoes straight off the vine in salads and just sliced for a luncheon plate or a sandwich. But what to do with the excess? You can freeze and can them, but my favorite way to use them when I have extras is to roast them and then use them for sauces. If you have never done this before, you are in for a treat. Roasting them is so easy. Just follow these steps. 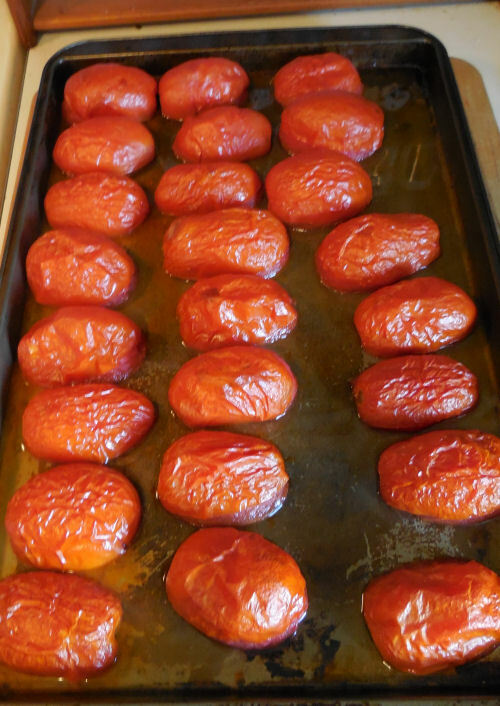 Preheat the oven to 450 degrees F.
I started with plump Roma tomatoes this time. They are plentiful and not too watery to start with. 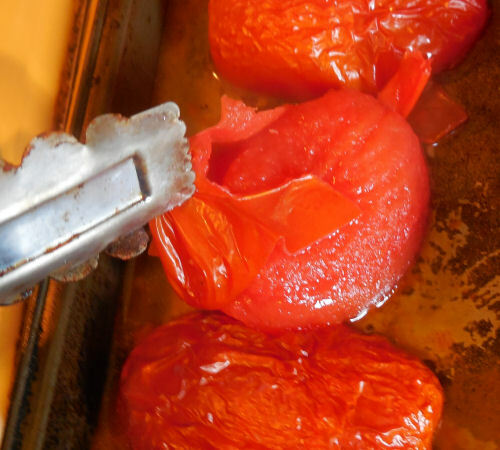 Slice the tomatoes in half and lay them cut side down on a baking sheet sprayed with a little Pam cooking spray. Remember to cut out the area where the tomato joined on the vine for easy skin removal later. 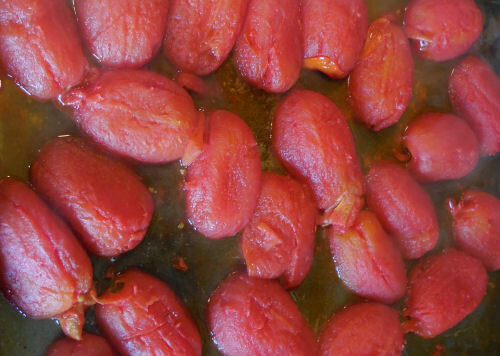 Roast the tomatoes for 15-20 minutes until the skins start to wrinkled. Mine took about 20 minutes. These have all had the skins removed and only the tomato flesh remains. 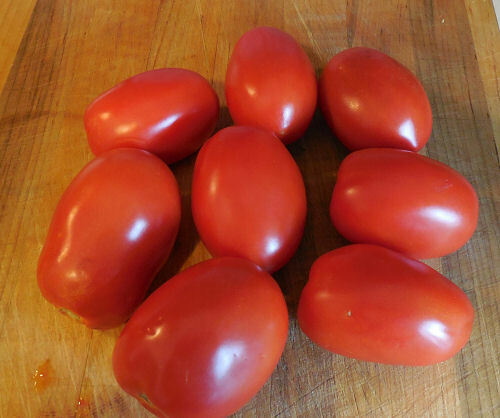 These may look just like whole canned tomatoes but you won’t believe the difference in taste. Discard the skins that you just peeled off. They make a nice addition to your compost pile!. 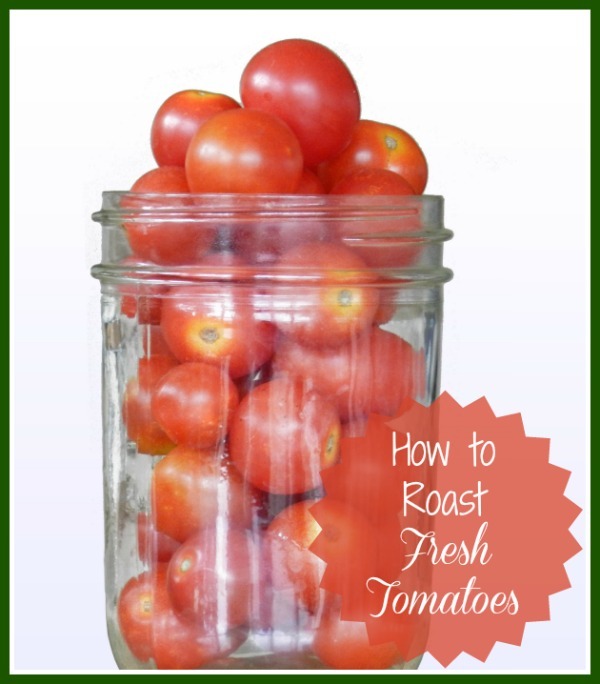 Roasting fresh tomatoes is super easy to do. They are now ready to use in your favorite Italian recipes. 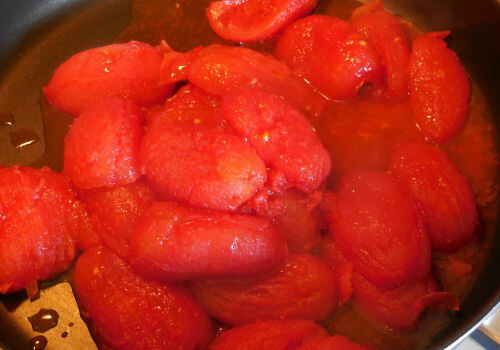 Here is a recipe for a wonderful roasted tomato marinara sauce. And a second one for a delicious home made roasted tomato mushroom marinara sauce. Hi! So I followed these directions but used early girl tomatoes and mine ended up really watery and most of them did not come out of their skins very well (though I did snip off the part where the stem was attached). Any idea what I did wrong? 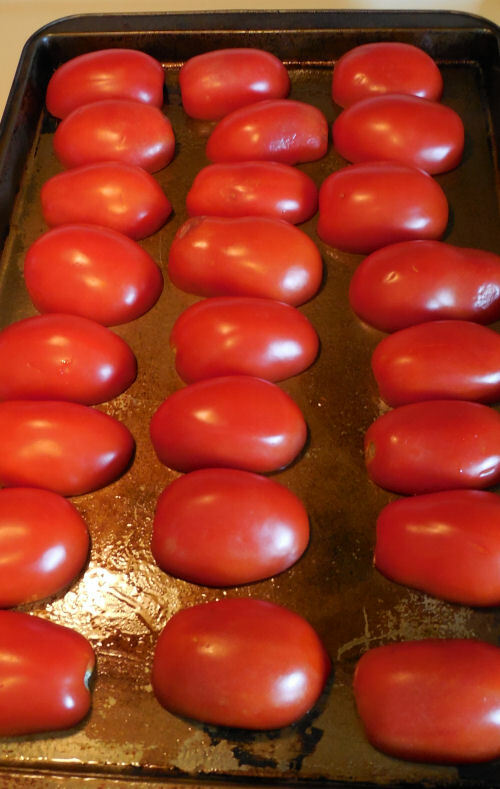 I definitely cooked them a long time and I am wondering if the type of tomato matters…. I have used two types of tomatoes. Both worked fine. Mine have pretty good substance when cooked and I did not have to roast them long for the skins to shrivel. It could have to do with how ripe they are, since more ripe ones start out more juicy? This worked great for me, but yes it did not work on under ripe tomatoes, I cut off portions that were under ripe, after roasting. My question is about the seeds. We where blanching and then de seeding, I like the flavor of the roasting much more. Do you de-seed for your sauce? I used a strainer, but the texture was then too thin, for the rustic sauce I like. Any suggestions? Hi BeckE. I did not de-seed at all and it did not make any difference to texture or taste. And, yes, they would need to be somewhat ripe for it to work, I would think or you would have to roast so long they would get watery. can you can these for use later? what is shelf life if so? My problem is the same as Laura’s. Could I use something to thicken it up, and if so, what would you suggest? Hi Shanna. Not sure what to thicken it with. Mine did not produce the juice that yours and Laura’s did. I was taught to make homemade sauce from my Italian grandmother Years ago . ( not telling how many years ) . 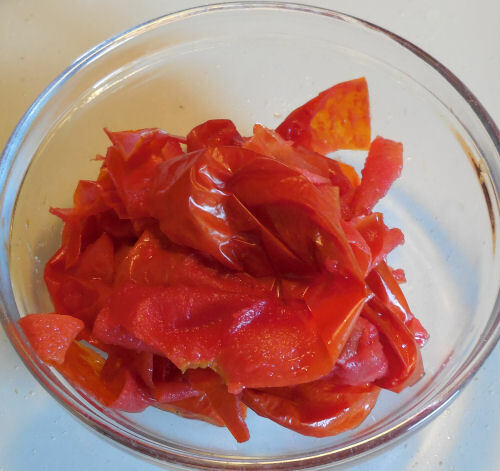 You can make sauce from any tomato however the roma tomato or plum tomato is the best for sauce because they are meatier than slicing tomatoes . She would actually soak the tomatoes in hot water and the skin would come off . Roasting them sounds yummy though and I will try that . She also smashed them in a colander to remove the seeds that can make a bitter taste in the sauce . The sauce was put on the stove in a big pot and cooked all day long adding your favorite spices and meat . Sure makes sausage, meatballs , or steak pieces so tender . She would sometimes add a small can of tomato paste if using regular slicing tomatoes . Now available in the organic isles at the store also . Vegetarian sauce can be made with onions, mushrooms , and a few dice carrots . Carrots add a little sweetness if you don’t want to add sugar as some people do.Basil is also sweet. Bon appetite ! Hope I helped a little . It sounds like you learned from a master!